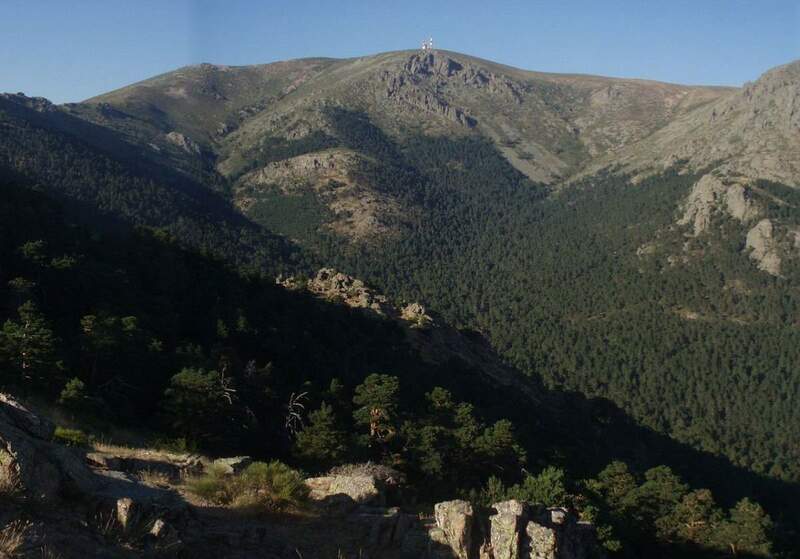 Bola del Mundo, also known as Alto de las Guarramillas is a mountain of the Guadarrama mountain range located in the Community of Madrid in Spain, near the border with the province of Segovia. Its height is 2,257 meters (some sources give it 2.265 meters). It is one of the hardest climbs ever seen in pro cycling. Despite its modest average gradient of 6.2%, the climb gets really hard in the final kilometers where the average gradient is always above 10% and at some points, it gets as steep as 19%. The summit of Bola del Mundo. These three large antennas are covered with a warmed-up radom in the form of a missile that protects them from frost, are visible from a distance of several kilometers and are the most peculiarities of this mountain, which is very easy accessing from Puerto de Navacerrada. At present, the number of antennas has dropped a lot shortly after being shot down by the strong winds affecting the area on several occasions, and it is not excluded that they will completely disappear in the future when they lose their function and will be replaced by satellite telecommunications. The Bola Del Mundo was first included in the Vuelta a Espana in 2010. Stage 20 witnessed a heroic battle between Vincenzo Nibali (Liquigas-Doimo) and Ezequiel Mosquera (Xacobeo-Galicia). Both riders have still had a chance for the overall victory as Nibali was leading Mosquera with only 50 seconds. 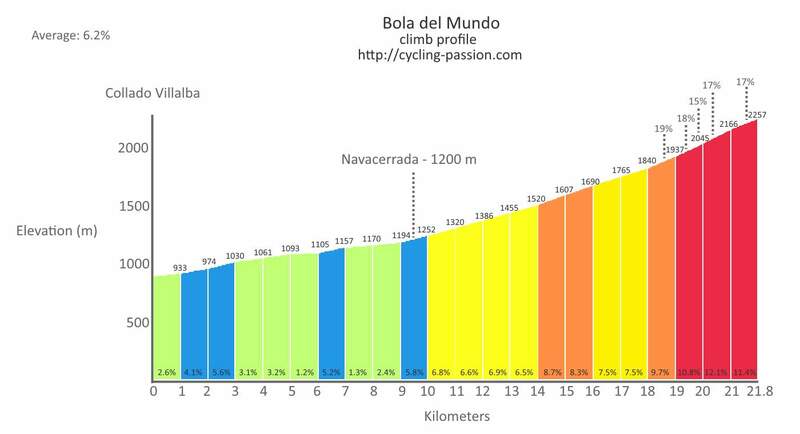 On the Bola del Mundo climb, Mosquera attacked and at some point, he was the virtual race leader. It seemed like Nibali had hit the wall. However, the “Shark” found his legs, came back strong and caught Mosquera. Then he rode a few seconds next to Mosquera, as if he was going to attack him, to show everybody who was the boss. But slipped back on his wheel and gifted the stage to the Spaniard. Vincenzo Nibali won 2010 Vuelta a España. It was his first grand tour victory. In the following years, he won two Giri (2013, 2016) and one Tour (2014), becoming the sixth cyclist to win all three grand tours. Later, after testing positive for hydroxyethyl starch in the race, Mosquera was suspended by the UCI and his results from the 2010 Vuelta were annulled. Here is the video of the final kilometers of the Bola del Mundo climb at Vuelta a España 2010 stage 20. The 2012 edition of the Vuelta a España saw the return of the Bola del Mundo mountain top finish. The climb was also included in the 20th stage. Denis Menchov, Russian rider of Katusha team won the stage.